Fleas are a big problem to pets and owners, but just like some people, some pets are more sensitive than others. Their bites in general will make individuals scratch and chew. Flea saliva can cause severe allergic reactions in some pets. Results include rashes, infections, and even open sores. You will usually find these located at the base of the tail and the belly. Also fleas can cause anemia, especially in small animals such as puppies and kittens, which may result in death. Using a preventative regularly is the best way to deal with fleas. 1. Of the 250 species of fleas, only 2 will infect your pet. 2. An adult female flea can lay 10–50 eggs each day and can lay about 2,000 in her lifetime. 3. Eggs will fall off into the environment. Whether it is outside somewhere, or inside on the carpet or couch, depends on where the host animal happens to be. They will hatch into larvae and burrow deep whether it be in the grass or mulch or your carpet. 4. Once they have found this niche inside or out, they will develop into pupae and eventually form a cocoon. Then they will wait for vibration, heat, carbon dioxide, or pressure to stimulate them into emerging as an adult flea. If conditions are okay and there is no stimulus to emerge, the flea can stay in this stage for months and months. 5. The lifetime of an adult flea on a host is 3–4 months. 6. The lifetime of an adult flea removed from a host is 72 hours. 7. No flea can survive below 33°F. 8. Most fleas cannot survive outside because of freezing and other insects. The flea season is in our area usually begins in late April to early May and can last in mild years into December. If they get inside, there is no seasonal aspect. They can be present year round. Fleas are persistent little critters—they can come in uninvited on your pet and into your home. Here are some ways to see if you have a flea problem. To see if your pet has fleas, try using a flea comb through your pet’s hair to collect the little pests or flea dirt. In your home, put a bowl of water on a white towel on the floor in area frequented by your pet. Then place a lamp over the bowl. The fleas will be attracted by the heat. To check if any fleas are on your furniture, you may be able to see specks of flea dirt (looks a bit like pepper) or in rare cases, white sand-like specks, flea eggs. Fleas don’t like us as a regular host, but they will bite us! Fleas do not usually survive long periods in the yard, as environmental conditions can be detrimental and other insects will eat them. Some fleas can carry infective stages of tapeworms. So it would be possible for a pet to develop this intestinal parasite secondarily to having fleas. These are treatable with pills or by injection. Should a pet have a flea issue, they should be treated, sooner rather than later. The treatment of fleas is never easy. However, there are now products to make this job easier! Dips are rarely used any more for the treatment of fleas, thanks to the innovative and highly effective products on the market. We use Vectra 3D® for dogs and Revolution® for cats and some dogs at our hospital. We also have the new Comfortis® and Trifexis® flea pills. We have found that these are effective products for treating our furry friends. Vectra 3D® will protect your canine friend from fleas and ticks for about one month. Revolution® will protect your feline or canine friend from fleas for about a month. We also have Comfortis® and Trifexis®, which are oral medicines for dogs that require monthly doses. Comfortis is also useful for cats. There are two new oral products now available for dogs; Nexgard and Bravecto. Nexgard is a very palatable chew that provides protection against both fleas and ticks when given monthly. Bravecto is an oral chewable that will give three months of protection from both skin pests. We also have household treatments to help win the battle against fleas. Treating the environment is as important as treating the pets. In the long run maybe even more so. Always remember to treat all the pets and the household at the same time. Even if one of them is without symptoms, they should be treated. 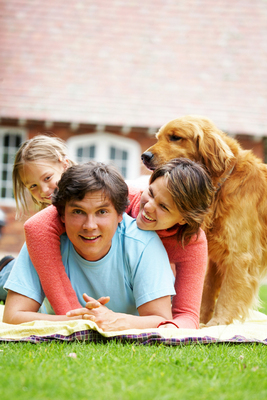 All areas of the home that the pets have access to must be treated. It is important to really target the areas where they spend time, like under a bed or in a closet. Don’t forget under couches, pet beds, on window sills, crawl spaces and garages! Though it won’t be simple or easy, It is possible to be successful with eliminating fleas from pets and the home. Using flea preventatives through the risk periods is the best way to keep from having to deal with a flea infestation on a pet or in the home.